Two God-Eternal spoilers rock War of the Spark. 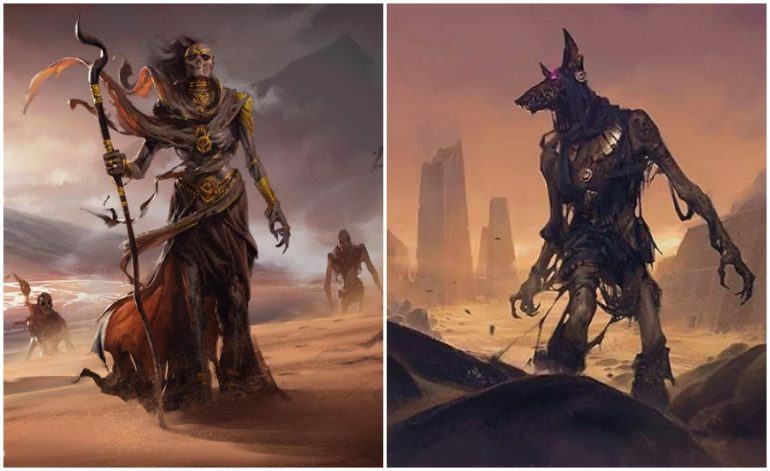 The newest MTG expansion, War of the Spark, is bringing back the gods of Amonkhet to join the 36 planeswalkers already announced. Releasing at the end of April, the gods aren’t holding back in the final fight for Ravnica. The two most recent spoiler god cards are Legendary Creature God-Eternal Bontu and sorcery card, Enter the God-Eternals. Packed with heavy-duty power and abilities, War of the Spark continues to shake things up. Enter the God-Eternals is a five mana (two blue and one black) sorcery spell. Upon entering the battlefield, it deals four damage to a target creature while giving life-gain equal to the damage dealt. In addition, target player puts the top four cards of their library in the graveyard. If this was it, Enter the God-Eternals would be an alright card but nothing special. But it also has an Amass of four. The new mechanic Amass adds a +1/+1 counter to your Zombie armies—if none exist, it creates a 0/0 Zombie token with the number of Amass counters on it. Since Enter the God-Eternals is a five mana multicolor sorcery spell, it’s unlikely that it’ll see much play in Standard. Limited players, however, will be treating it as a bomb when putting together zombie, god, and planeswalker decks. 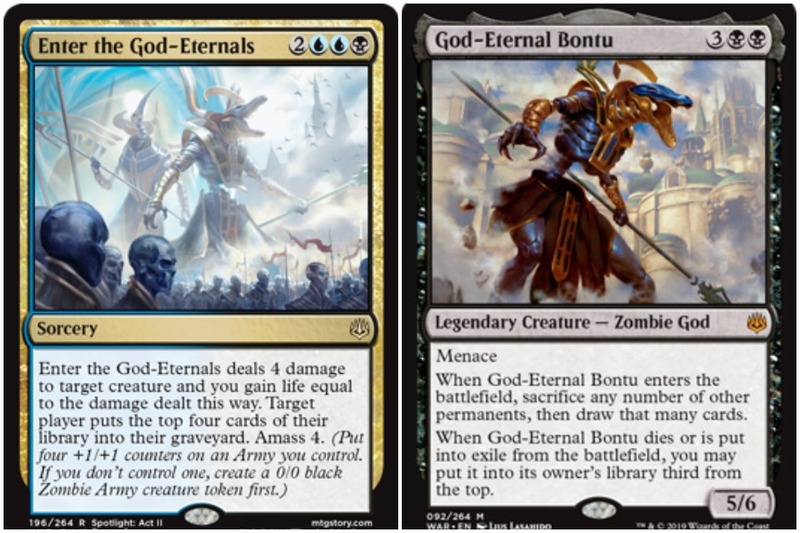 God-Eternal Bontu is a five mana (two black) Legendary creature who’s a Zombie god. He has a power of five and a defense of six, along with the static ability of menace. God-Eternal Bontu allows the player to sacrifice any number of permanents upon entering the battlefield, then draw that many cards. He also has a second static ability, which says if he dies or is exiled from the battlefield, God-Eternal Bontu is placed in the owner’s library third from the top. Much like Ilharg, the Raze-Boar, he can’t permanently be removed from the game. In addition, Bontu is a bomb in Limited and Standard, especially at only five mana to cast. Add deathtouch to him and God-Eternal Bontu is an even greater threat in creature and mid-range decks. Combining the power of the gods with 36 planeswalkers is a bold step for Magic: The Gathering. War of the Spark is set to be released on April 27 in MTG Arena.